“The Tohono O‘odham Nation is now occupied by a foreign army called the US Border Patrol." Tohono O'odham Mike Wilson. TUCSON -- An Israeli speaking out for the rights of Palestinians visited the Tohono O’odham border and then shared her insights on the similarities between the treatment of Palestine by Israel, and the treatment of American Indians by the colonizers of the US. Dr. Dalit Baum, an Israeli and economic activist for Palestine, spoke to students at the University of Arizona, and Tucson community activists, on Friday, leading a discussion on economic activism as a tool for change. “It is horrifying that the same wave of violence is ebbing and flowing, and coming back,” Baum said. Baum spoke on the same day that protesters were in the streets of Tucson demanding an end to Israel's deadly violence and bombing of Gaza, which continued throughout the day and into the night. Baum said the reason to protest for a stop to the killing is to bring people together and remind them that they are not alone. It is a way to translate grief and frustration into action, and renew hope. Baum visited Tohono O’odham land, and the US/Mexico border in Arizona, this week with human rights activist Mike Wilson, Tohono O’odham, who puts out water for migrants as humanitarian aid. Although Native Americans in the US have been targeted for centuries with ethnic cleansing and genocide, what is happening in Israel and Palestine is relatively recent in history, and escalated primarily over the past ten years. Unfortunately, the treatment of American Indians has served as an excuse for Israel in regards to occupation, apartheid and ethnic cleansing. Baum said that many Israelis say that the US has done the same thing to their own Indigenous Peoples and therefore, Israel should be able to have the same right. She said that European colonial history has resulted in a sense of guilt, both because of the history of Jews and also because of the history of Zionism. Currently, Israel controls the entire area of Israel and Palestine and controls Palestine in different ways. For instance this control results in violence in Gaza. In the West Bank, there is the takeover of land and resources, a violation of international law. The history of the Occupation of Palestine is relatively recent compared to Indigenous history, she said. Today, we live in an era of the war on terrorism, which is an engine of growth. It produces economic incentives for the products like the spy towers and border wall here in Arizona on Tohono O’odham land. Baum said it is an apartheid situation. Israelis control the region, while Palestinians do not have full rights in regards to land and citizenship. Even for those who can vote, the Palestinian Authority controls a very small area of Palestine. Meanwhile, there are Israeli army raids and they can arrest anyone. The situation in Palestine is apartheid under the United Nations definition. In 1948, there was ethnic cleansing and most Palestinians were pushed out and forced to live in refugee camps. At that time, 95 percent of the land was owned by the people, and now, they are no longer owners of their land. The land of Israel and Palestine is a small territory compared to the US and there is a small economy. Israel is dependent on the United States. “All of the time you have the feeling of claustrophobia,” she said. In Europe, Israel is viewed as the outpost of the west. Israel is dependent psychologically and economically on the west. Baum pointed out that the feeling of impunity present in Israel and the position of people of simply maintaining, is the biggest threat to the incentive for change. Grassroots solidarity is a call to people of conscious. It includes boycotts, sanctions and economic divestments, such as divesting of pension funds. The grassroots movement is calling for an end to the occupation, implementing the right of return of refugees and full equality for Palestinians, including those who live in Israel. The grassroots movement has no political outline, and is based on international law and human rights. “This is something that everyone can agree on,” Baum said. So far, 170 organizations signed the accord. During the discussion and call for boycotts, it was pointed out that individuals are not boycottable. Institutions or corporations that are complacent, including the state of Israel, are boycottable. When asked about the boycott of an Israeli dance company, it was explained that it was boycotted because it was paid for by Israel’s Ministry of Foreign Affairs to whitewash the occupation. The dance troupe served as cultural ambassadors of Israel. When a dance troupe participates in that exchange, it becomes an arm of the state and normalizes the occupation. Attending or promoting such a cultural activity is complicity. The events can also serve to educate the people outside the dance troupe performance. One example of taking action at the university, is to ask it to divest in specific corporations or investments. Currently, there is an economic boycott of Veolia, which privatizes public transportation around the world, and provides waste dumping. In Palestine, Veolia brings waste and dumps it on Palestine land, which is in violation of international law. It is done in a place where there was ethnic cleansing. Veolia also operates segregated buses. Meanwhile, in Tucson, Veolia has a contract with the public transportation system, SunTran buses. Referring to actions regarding Veolia, Baum said, “That is the power of this movement. It is truly global.” Because of its action of dumping waste in Palestine, and operating segregated buses, Veolia lost contracts in the UK and Europe in 2006. Today in the US, three areas have taken the lead in boycotts of companies who violate human rights. In support of Palestinians, Boston, Chicago, and Sonoma County in Calif., have taken the lead. In Sonoma County, Calif., the Human Rights Commission initially said that they could take no action because they have no jurisdiction in Palestine. However, three hours later, following community members objections and input, the conclusion changed. Sonoma County residents said segregated buses in Palestine by Veolia violate human rights. One man said he lives here, but his family lives in Palestine. When he was there, he saw Palestinians removed from a segregated bus. “There is a real problem and we are complicit in it,” said the people of Sonoma County. Since Veolia has business here in Tucson, there were suggestions as to what could be done. “Buses are a wonderful place for action,“ Baum said. With buses, actions can include street theater, a mock segregated bus and educating riders on the bus. Mike Wilson, Tohono O’odham pointed out that G4S has a huge contract with Homeland Security at the US/Mexico border to transport detained migrants. 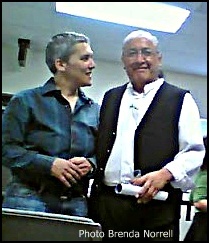 Wilson said Homeland Security has created an occupation on Tohono O‘odham land. “The Tohono O‘odham Nation is now occupied by a foreign army called the US Border Patrol. Wilson said the US Border Patrol now has superior power on O’odham land to that of the Tohono O’odham Nation and the Tohono O’odham Police Department. Wilson is policy director for the Border Action Network. For years, Wilson has placed water in gallon jugs and tanks, on the border for migrants, over the objections of the Tohono O'odham government. This area is where a large number of migrants die each year from heat and dehydration in the Sonoran Desert. Tucson activists pointed out that the G4S buses, once labeled Wackenhut, afflict cruel treatment on migrants, since migrants are forced to sit in the sun, or in overheated buses, for hours at a time. Many are already dehydrated and near death when they are taken to the buses at the border. Another company contracted for work at the US/Mexico border in Arizona is Elbit Systems, the Israeli defense contractor who also provides security at the Palestine border. Elbit was subcontracted by Boeing for work on the US border wall and spy towers. During the discussion, it was pointed out that individuals are not targeted in boycotts, and neither are companies whose involvement is over. In the latter case, this would not be conducive to an incentive to change. “We are dealing with corporate policies, trying to make them better,” Baum said. Baum pointed out that Polaroid was the first company to divest in South Africa apartheid and the movement was led by company employees. Baum also suggested fun and creative campaigns to support human rights in Palestine, such as painting bulldozers pink. 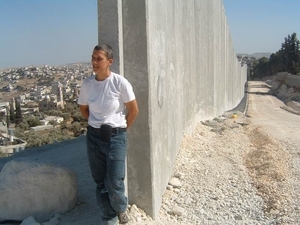 Dalit Baum, Ph.D., is a co-founder of Who Profits from the Occupation, an activist research initiative of the Coalition of Women for Peace in Israel. During the last five years, Who Profits has become a vital resource for dozens of campaigns around the world, providing information about corporate complicity in the occupation of Palestine. Dalit is a feminist scholar and teacher in Israel, who has been teaching about militarism and about the global economy from a feminist perspective in Israeli universities. As a feminist/ queer activist, she has been active with various groups in the Israeli anti-occupation and democratization movement, including Black Laundry, Boycott from Within, Zochrot, Anarchists against the Wall and Women in Black. This year she works out of San Francisco with the Economic Activism for Palestine Program of Global Exchange, which supports corporate accountability campaigns in the U.S.